If you follow me on Facebook, you’ve probably seen me share some new videos on depression and anxiety. Or you may have seen this article being shared about Johann Hari’s new book, Lost Connections. Well… I’ve been reading this book and it has me obsessed–with how to reconnect in my own life AND how to help others reconnect with themselves, community, and their humanity. You can watch the videos online to learn more, but Hari’s basic argument is that a lot of the depression and anxiety experienced in society today is not due to an abnormal response to life, but instead stems from a very normal response to an inhumane way of life. Over the last several years, as I developed my own meditation (and later yoga) practice, I became much more adept at tuning in to my own needs, both physical and mental. Over time, I slowly recognized that I am called to live a life that is slower, more natural, and focused more on connection and community than achievement. My recent studies on depression, anxiety, trauma response, and healing have only helped to solidify and support my belief that mindfulness practices (such as yoga and meditation) and daily self-care are at the heart of living an embodied life… because your first connection is with yourself. 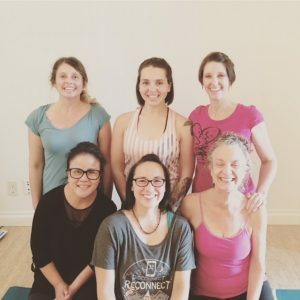 Every time I teach, whether through group classes or private sessions, I am reminded of the power of self-discovery and connection to community… for it is in the act of coming together that we truly get to know ourselves.